Bringing in top organizations from the Greater Hamilton Area, the Connect to Careers Job Fair will connect students and alumni to 140+ organizations, totalling more than 300 opportunities to get hired. Most notable this year is the fact that 90 per cent of the organizations attending will be hiring for full-time positions and almost half are recruiting for summer job opportunities. To help students prepare, the Student Success Centre will be hosting a number of career sessions on campus during the final weeks of January as well as two Resume Blitz days. At the Resume Blitz, students and alumni can bring in their resumes for feedback from on-campus career experts. These drop-in sessions will take place on January 30 and February 1 from 11:00 a.m. to 2:00 p.m. in L.R. Wilson Lobby. No registration is required. The Connect to Careers Job Fair will take place on Tuesday, February 5, 2019 from 11:00 a.m. to 3:00 p.m. at FirstOntario Centre. Those attending the VIP hour can enter the fair at 10:00 a.m. There will also be a free shuttle bus available from McMaster University, operating on the half hour from Ivor Wynne Centre (IWC), starting at 9:30 a.m. The Student Success Centre will have a career staff available on the shuttle bus ride to answer questions and offer direction at the fair. Details about the shuttle service are available on the website. 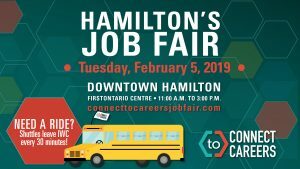 Connect to Careers is Hamilton’s largest job fair, presented in partnership by McMaster University, Mohawk College, Redeemer University College, Workforce Planning Hamilton and the City of Hamilton. Proud sponsors of the 2019 Connect to Careers Job Fair include: Pratt and Whitney Canada (gold sponsor); Columbia International College (silver sponsor); Eco Waste Solutions (silver sponsor); JNE Group Of Companies (silver sponsor); Keyence Canada Inc. (silver sponsor); and Tigercat Industries Inc. (silver sponsor). For a full list of organizations attending, visit the Connect to Careers Job Fair website.